A local Forsyth County resident plays an integral part in Daytona Bike Week March 8 to 18th 2019. Daytona Bike Week is a mortocycle event and rally, held annually in Daytona Beach, Florida. Approximately 500,000 people make their way to the rally area for the 10 day event. The festivities include motocycle racing, concerts, parties and street festivals. The event is usually held on the second full week of March as the most popular motorcycle rally in the United States. 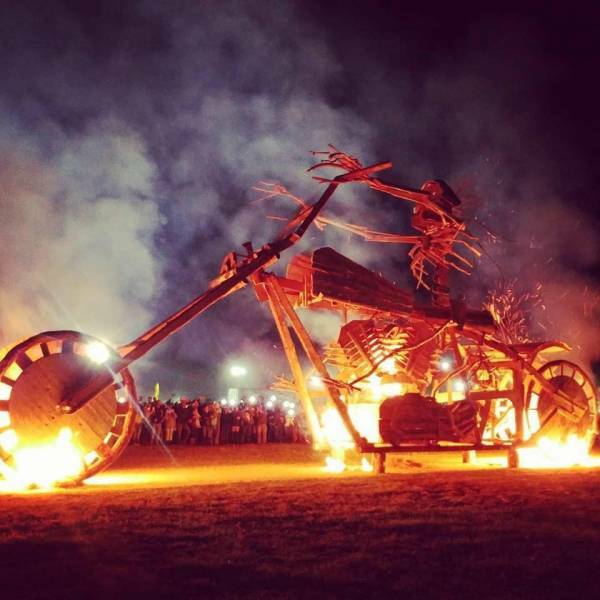 What you did not know is a local Forsyth County resident, Stevie T, a founder and producer along with his associate are planners and organizers of "Burning Bike" located at the Fastlane Campgrounds. They have been running a swap meet for about 20 years at the Volusia County Fairgrounds. When the camping area came available 5 years ago they aquired it. Camping for 100 RVs full hookup and primitive area for about 3000 campers. Then 5 years ago they started "Burning Bike" trademarked the name and have an annual bike burn on the last Friday of bike week. Campers receive free passes to the swap meet and Burning Bike along with free entertainment nightly. The annual Burning Bike continues a tradition that started long ago in the spirit of a lifestyle that so many bikers hold dear. There will be daily bike shows/exhibits along with largest swap-meet in the central Florida area and on burn night a Bikini contest. All leading to the burning of our namesake bike. The giant motorcycle that has stood as the events centerpiece is crafted entirely of reclaimed wood and is sure to cast flames long in to the night. There will be bands and fun. Come sign the bike anytime during bike week and the burn will send your message off into the heavens. Fastlane has strived to make Burning Bike an all-inclusive experience by meeting the needs of all guests. The easy access parking and short/long term campsites make for a safe, secure, and convenient place to enjoy the festivities, and all that the area has to offer. Whether you've traveled from "around the globe", or rode in from "around the corner". The annual Burning Bike festival promises to give guests a new and unique experience, while maintaining the traditions and mystique that is Daytona Bike Week.